Murrill, W.A. 1912. 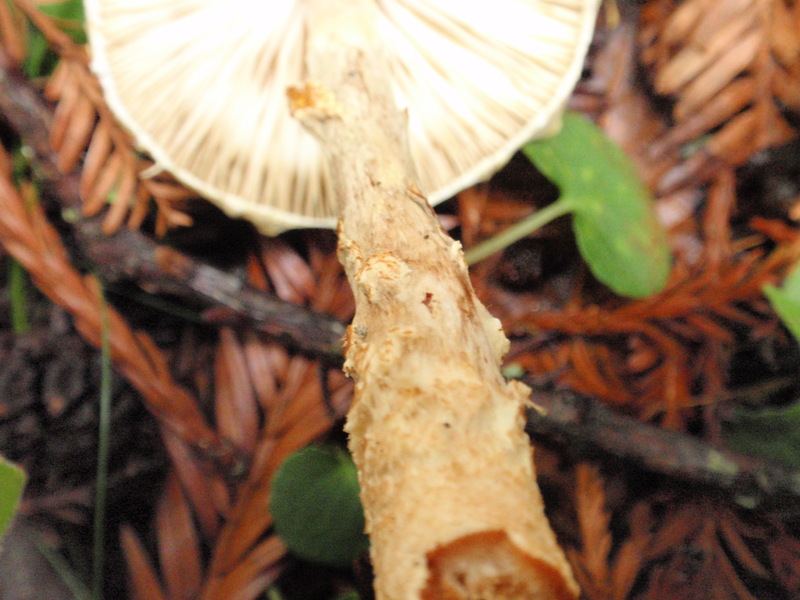 The Agaricaceae of the Pacific coastâ€”II. Mycologia 4(5): 237. Pileus thin, conic to convex, with a more or less prominent umbo, finally nearly plane, 3-5 cm. broad; surface dry, shaggy, imbricate-floccose-scaly, the umbo fulvous with erect scales, the rest of the surface pale-isahelline with numerous, darker isabelline or fulvous, upturned scales thinning out toward the margin, which is decorated with projecting scales and fragments of the veil; lamellae free, not crowded, of medium width, white; spores oblong-fusiform, smooth, hyaline, 15-18 X 4-5 Âµ; stipe slightly tapering upward, with a small bulb at the base, glabrous at the apex, very floccose-tomentose and isabelline below, about g cm. long and 6 mm. thick; veil cottony, ample, ochraceous-isabelline, not forming an annulus but adhering to the margin and stipe. Type collected on the ground among dead leaves in deep woods near Seattle, Washington, October 20-November	1, 1911, W.A. Murrill 704. Also collected as follows: Seattle, Washington, Murrill 512, 518, 601, Zeller 114; Stanford University, California, Miss Patterson 23.